Build an Arduino Robot? YES YOU CAN! Build an Arduino Robot, will you? This new book was written with the ABSOLUTE BEGINNER to Arduino in mind. It starts you at the beginning and takes you through the building process step-by-step. Build an Arduino Robot? - Click HERE to get book for 99 Cents! 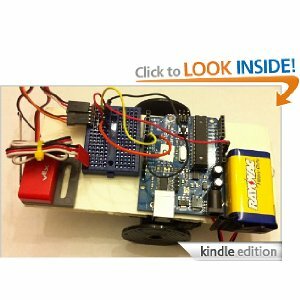 This book, available on Amazon.com presents the user with instructions on how to build a robot with an Arduino microcontroller, step-by-step. It starts out slowly and builds the new roboticist's confidence. This is the first of a 10 part series in building and programming Arduino robots. By the time you complete all 10 modules you should have yourself a little Arduino robot running around the floor, beeping, blinking, following lines, entering sumobot contests, and more. This is a beginner’s course. It starts with the easiest concepts and goes on to building complete robots. Please don’t just read this course please make sure you DO THE LABS. You learn by doing, so do a lot and learn a lot! Arduino Module 1: Let There be (LED) Light! A microcontroller is a tiny computer usually on a single computer chip, usually without a screen. It often requires a full-size computer to program it. In addition to robots, microcontrollers are used in cars, TVs, remote controls, MP3 players, cell phones, and so most other electronic devices these days. Gary Boone and Michael Cochran, engineers at Texas Instruments succeeded in creating the first microcontroller, the TMS 1000, in 1971. The result of their work was sold commercially in 1974. Click -->> HERE <<-- to Order From Amazon.com! Did you know that the next chapter (again it will be ONLY 99 cents) will be on the actual construction of the robot? Constructing the robot is quite easy. Actually, the only thing it takes is a small rectangle of plastic, foam board, or wood, two servo motors, a touch sensor, and an LED or two. Put those together with your Arduino, and you will have a robot. 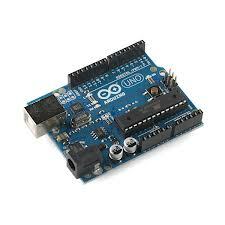 It will all be in the second installment of the Arduino book. Due to be out in the next month or so.